[Official Debate] How much of an impact have Fansites actually had on Habbo? Thread: How much of an impact have Fansites actually had on Habbo? How much of an impact have Fansites actually had on Habbo? It's no question that Fansites have helped develop and shape Habbo to what it is today, but how much of an impact have Fansites actually had on the platform? 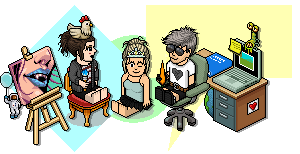 Fansites create a different platform for Habbos outside of Habbo to engage with each other and become part of a community. During the first 6-7 years, Habbo didn't seem to do anything alongside fansites aside from open up applications for them to have the status of "Official Fansite"
However, in more recent years Habbo seems to have seen the benefits of Habbo fansites and have since started working closely with fansites from doing things such as creating badges, rooms, events, games and even having Habbo staff promoting said events. There is also even now a section in "Public Rooms" on the navigator dedicated to Official Fansites. There are also a number of fansite members that no longer play Habbo but stick around in the Habbo community because of the fansites. Would the amount of Habbo users be the same right now if fansites didn't exist? Do you think Habbo would have seen the growth and success it's had without Fansites? Last edited by Sloths; 13-04-2019 at 01:45 AM. This debate is now open! I'm not really speaking from experience as this (and script-o-matic) were the only forums I ever signed up to. Reach out to a new audience. Is there any evidence that fan sites generate new players? I think it's safe to say fan sites like Habbox promote interaction with the platform. But do these users spend money based on that interaction? Existing members will almost certainly be spending money on Habbo. But no revenue is generated on those that don't play. I joined Habbo because of word of mouth from my friends that had likely seen the game through an advertisement. How many members on this site were introduced to a fan site first and then signed up to Habbo later on? The question is redundant because of the lack of data, metrics and measurements but it's fun to debate. Basically without Habbox I would probably have soon stopped logging into Habbo altogether. So it's a Fansite that brought me back and got me somewhat playing Habbo and even spending money again; not Habbos advertisements or promotions etc.. Purely the people and community within Habbox itself. I wouldn't have thought that there would be a lot, if any Fansites that got people on Habbo without them knowing about it first, but I'm sure there are a few cases, statistically anyway right? But think about the fact that there are probably a lot of old-timers, who only stick around because they're so engrossed in a fansite that they can't just pick up and leave, as they have developed friendships over many many years, which gives them reason to login to Habbo and potentially buy credits, but then you got the fact that it also adds activity numbers for Sulake.